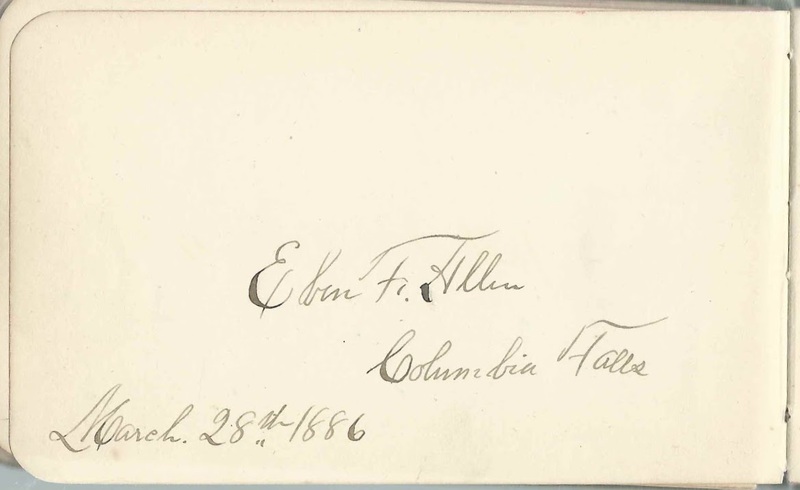 1880s autograph album of Berniece E. Allen of Centerville, Maine, and Columbia, Maine. 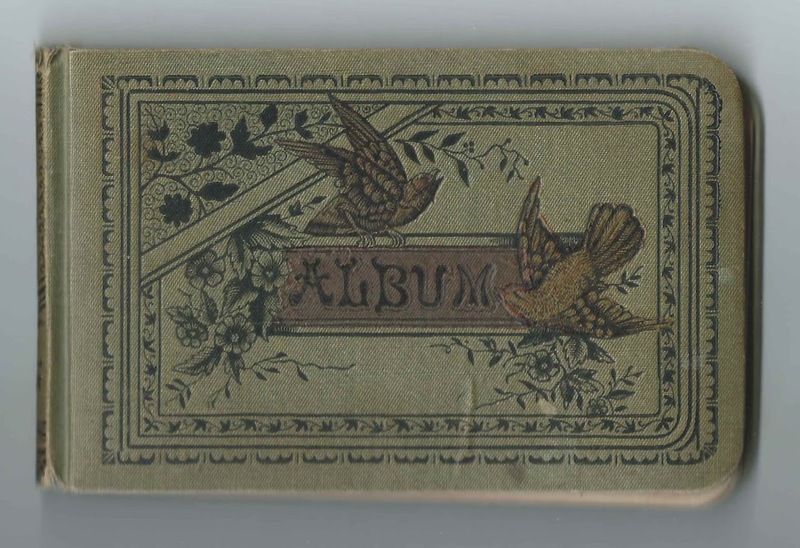 The album was presented to Berniece by her teacher, R. C. Drisko on July 30, 1881. He was Raymond Chandler Drisko. Some records show Berniece' name as Bernice, and some of the inscribers spelled their town as Centreville, rather than Centerville. Centerville residents voted to dissolve the town in 2003; it's now part of the Unorganized Territories. 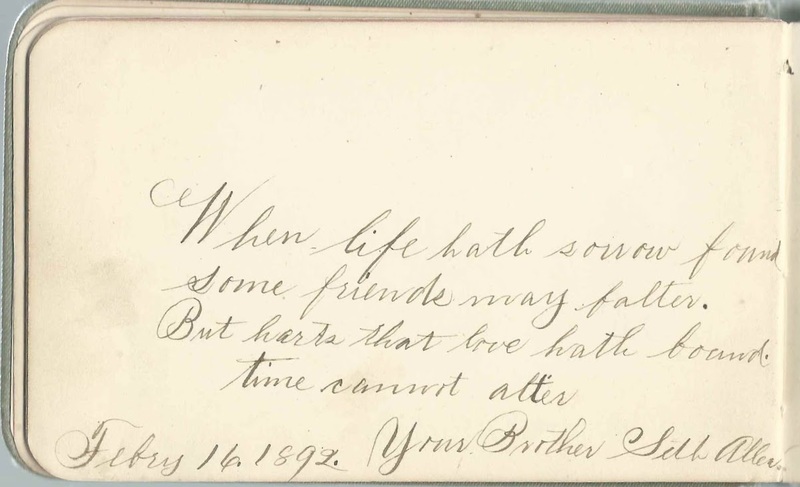 The album measures approximately 6-1/4" by 3-3/4" and contains the sentiments of 70 of Berniece's relatives, friends and schoolmates. An alphabetical surname list and an alphabetical list of the inscribers, together with any personal information they offered, appear at the end of this post. Berniece E. Allen was born August 22, 1871, the daughter of Ebenezer F. Allen, "Eben" and Julia M. (Smith) Allen. Eben was involved in civic affairs and held several offices in Columbia Falls, Maine. 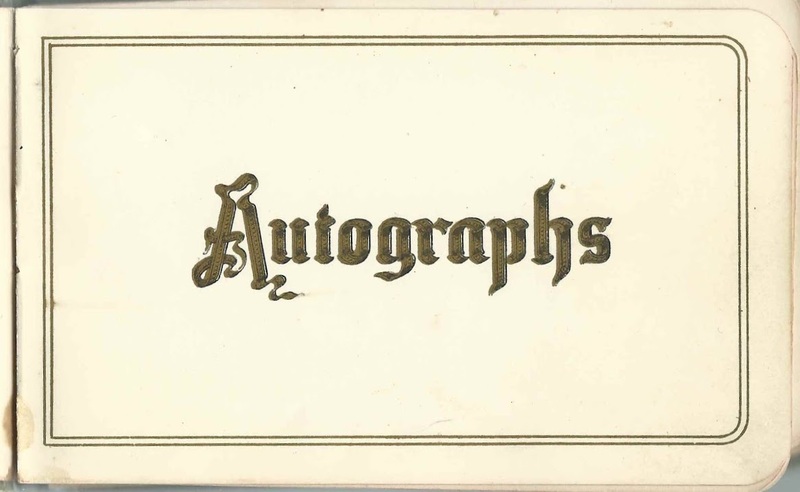 Berniece's parents inscribed pages in her album in 1886. 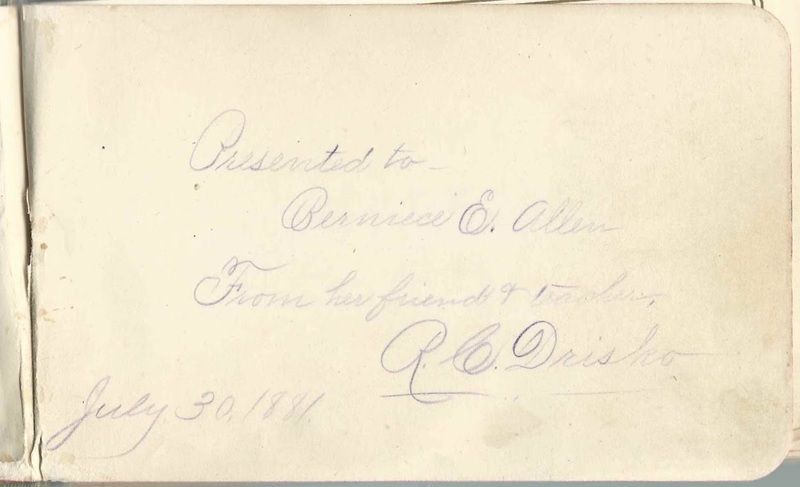 Berniece's brother Seth Allen inscribed a page in 1892. I believe that Berniece had at least one year of post-secondary education, possibly at a teacher's college. She owned a store at Columbia Falls. Surnames of inscribers who expressed a family relationship with Berniece [and there were likely more]: Allen; Haraden; Leighton; Look; Smith; and Wilber. J. M. Allen, inscribed at Columbia Falls, Maine, in 1886. Berniece's mother Julia M. (Smith) Allen. L. B. Drisko, inscribed at Jonesboro, Maine, on November 20, 1881. Katie Foster of Columbia, Maine, inscribed at Columbia Falls, Maine, on February 2, 1891. She wrote "High School" in a corner, so presumably she was Berniece's schoolmate. Mrs. R. A. Parker of Lewiston, Maine, inscribed in 1887. She was Mary Etta (Merrill) Parker, whose husband Ralph Almeron Parker inscribed the right facing page. R. A. Parker, "Bates '88", inscribed on February 8, 1887. "Your teacher". He was Ralph Almeron Parker, whose wife Mary Etta (Merrill) Parker inscribed the left facing page. S. K. Wilber. She was Berniece's aunt, Sophia Ruggles Wilber, wife of Charles L. Wilber and mother of inscriber Minnie S. Wilber of Portland, Maine. Sophia was the sister of Berniece's father Eben F. Allen. 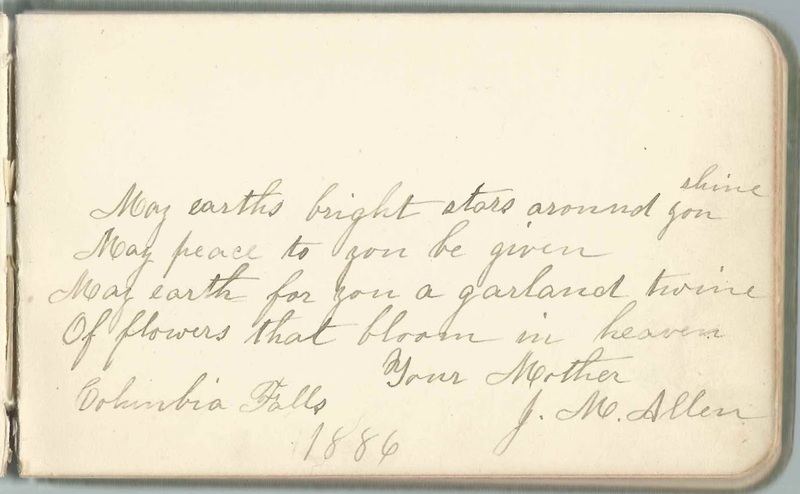 Minnie S. Wilber of Portland, Maine, inscribed on August 25,m 1881. Minnie's cousin, daughter of Charles L. Wilber and Sophia Ruggles (Allen) Wilber, sister of Berniece's father. Clytie R. Worcester of Columbia Falls, Maine, inscribed in 1888. Clytie was the daughter of Samuel Cummings Worcester and Rosina (Reynolds) Worcester.